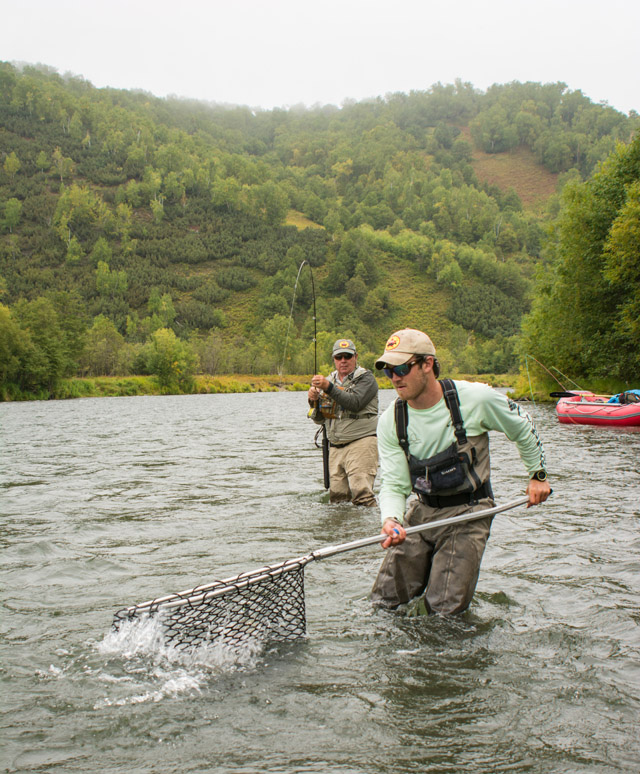 The Zhupanova was the first river "discovered" by western anglers in Kamchatka, and has remained a first rate destination ever since. Our program floats the very best fifty seven miles of river, passing through a spectacular wilderness environment surrounded by ancient forests, snow capped peaks, and active volcanoes with abundant wildlife every day. And the fish, well, the fish are simply amazing. Guide Christiaan Pretorius filmed and edited a first class video tour of his recent season on the Zhupanova river; ride with him as he and his clients land some of the world's largest and most aggressive rainbow trout and sea-run Kundzha, then check out all the trip details below and drop us a line to begin planning your Zhupanova adventure of a lifetime. 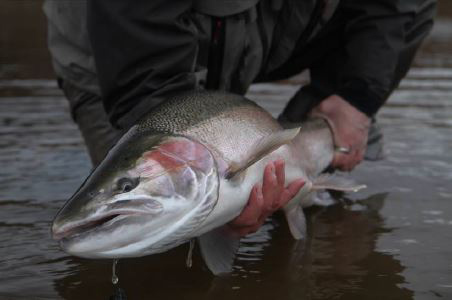 The Zhupanova is home to all the usual characters in terms of Pacific salmon and char, including some of the largest sea-run kundza on the peninsula, but the main attraction for most of our anglers is the rainbows. Unbelievably numerous and spectacularly large (averaging twenty four inches and with many going upwards of thirty) the rainbows of the Zhupanova are fly eating machines, hammering swung flies of all descriptions, from streamers to mice. We recommend seven or eight weight rods for this river, and suggest that anglers bring at least one backup rod and one backup reel; these fish are literally some of the strongest in the world for their size, meaning rods do get broken, and drags do get melted. 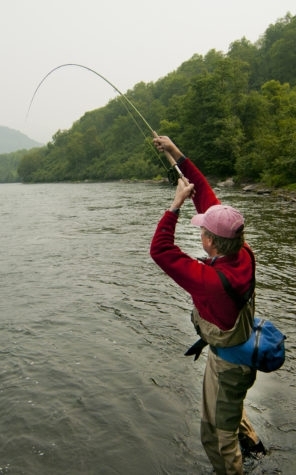 Having at least two rods also allows anglers to keep both rigged up each day, one with a floating line for mice and dries, and one with a sink tip for streamers, and as such can avoid having to change out reels or lines which results in loss of fishing time. Double handed rods, while not by any means a necessity on the Zhupanova, can in many places grant access to lies that would otherwise be unreachable. Anglers wishing to bring a spey stick are suggested to consider six or seven weights, eleven to fourteen feet long, with a skagit head and interchangeable tips, both floating and sinking. 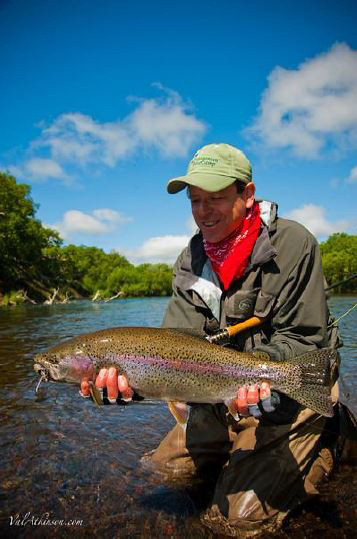 One thing Kamchatka rainbows are NOT is leader shy. We've yet to run into a circumstance in which we felt that anything lighter than 3x was necessary, and for the most part it is almost always going to be 0x or 1x all day long. Throughout the six day six night float trip, our guests spend each night in our permanent tent-cabin camps which are situated at proper stopping points along the river. 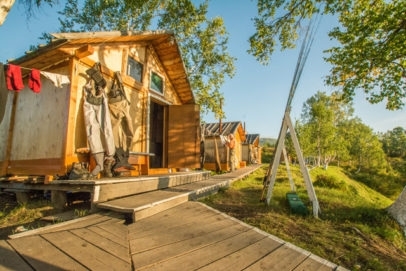 Each camp features double occupancy cabins with wood floors, wood stoves for heat, and bed frames with mattresses (guests must bring their own sleeping bags). 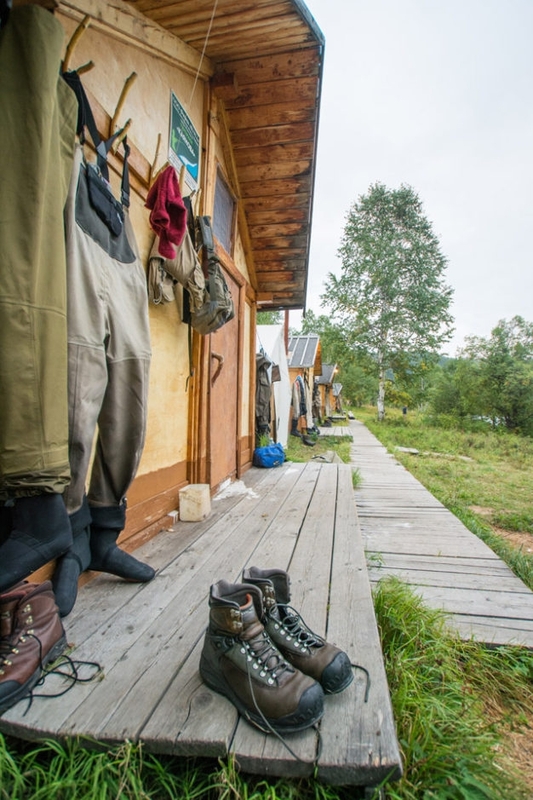 There are also two well maintained and clean flush toilette outhouses per camp, and excellent shower facilities with very good water pressure and more hot water than anyone could possibly use. 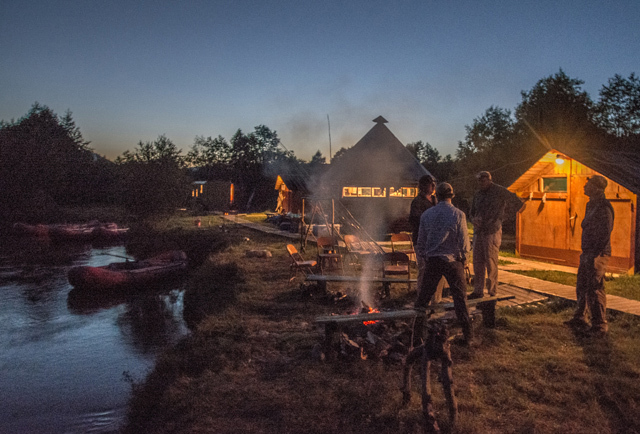 The kitchen and dining areas are in well constructed log yurts, and wooden walkways connect all camp buildings together. Each camp has power via a generator, and there are even plugs in the cabins. The generators will be turned on each evening and in the morning, and shut off at night. Russia operates on 220 volt output, so you will need the two-pronged outlet adaptor, standard for Continental Europe. Most modern cameras, satellite phones, laptops, iPods, and CPAP devices will accept the 220 volt output. Food on the Zhupanova Float Trips is both plentiful and satisfying, but not at the same level of gourmet preparation as you might expect from a typical Alaska lodge. Ingredients are for the most part locally grown, and foods served make a good mix of classic American fare with more traditional Russian cuisine. Generally coffee, juice and tea are ready by seven each morning, with breakfasts consisting of a variety of hot or cold cereals, pancakes, eggs and other sundries served by eight. Lunch is served stream side mid-day, and usually consists of a different hot soup each time plus sandwiches, sushi, or other such accompaniment. And dinner is planned for eight in the evening, and includes a variety of local dishes and old American favorites throughout the week. Beer is provided with dinner, and additional beer and vodka are available for sale. Other alcoholic beverages must be brought by guests from home. Our Zhupanova Float Trips operate weekly throughout the season. 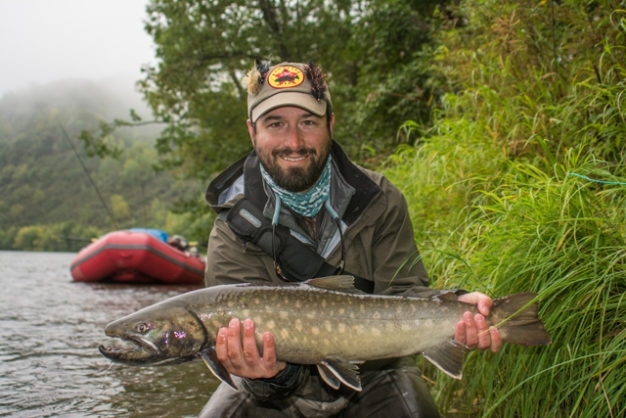 Most of our guests coming from the continental United States get to Kamchatka through Anchorage, Alaska, which generally requires flying in one day early and spending the night prior to leaving the United States. Other options include routing through either Moscow or Seoul. If you are traveling via Moscow or Seoul, you will most likely be departing on this same day as well (though some Seoul itineraries may require a Thursday departure). Departure on Yakutia Air is early in the morning. Check in usually opens around 5:30 a.m. (two hours before departure) and it is advised you arrive around this time. The flight lasts about 4.5 hours, and crosses the International Dateline. Thus, you arrive to Kamchatka on Sunday morning. Arrival from Anchorage is 8:00 a.m. Arrival from Moscow is 9:30 am. Arrival from Seoul is 11:15 am. After passing through customs and immigration, fishermen collect luggage and are greeted by Andrey Konovalov, our handler for Zhupanova trips, who will be greeting the incoming groups. Once all of the guests heading to the Zhupanova Float are through customs, Andrey and his helpers will help you load your gear onto two micro-buses waiting outside the small terminal. They will then drive to the offices of Purga, where Andrey will take your passports briefly to make photocopies to fill out the paperwork required for your fishing license as well as the paperwork that will be required for departure from Russia at the end of your trip. They will also request at this time the $100 (payable in $US Dollars is okay) for the weekly fishing license. The Purga offices are located adjacent to the heliport in Yelisovo. As soon as the pilots get the okay to fly, they will load your gear onto the helicopter board for the incredible flight into Zendzur Lodge. The first few hours in Kamchatka are always an exercise in patience. Understand that this is Russia, and communication from the helicopter companies is often lackluster at best. 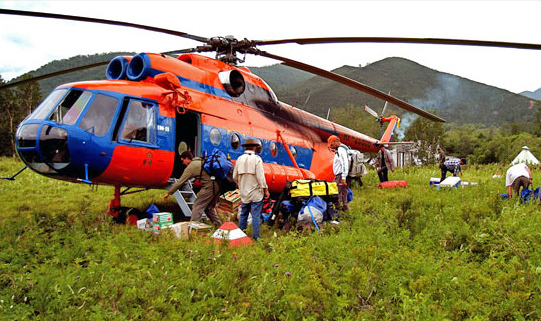 Keep in mind that the outfitters want you to get into camp as much as you do, and they are often at the whim of the helicopter companies. Everyone’s priority is to get you into camp…safely. Mornings in Kamchatka are frequently foggy, and the helicopters cannot fly until the fog clears. If the weather is clear in the morning, you will head straight to the heliport. 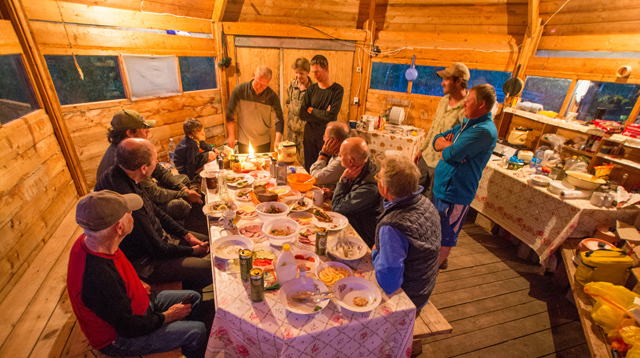 If the weather creates a delay, Andrey will give the group the option to travel to the nearby Old Castle Restaurant, which has very good food (and local draught beer, Kamchatksi #1). Lunch and/or drinks at the restaurant are not included in the package price, but typically range from $20-$30. They do not accept US dollars, but they do usually accept credit cards and Andrey will be on hand to help trade Dollars for Rubles. Don’t forget to call your Credit Card Company to tell them you will be traveling in Russia, to avoid issues while traveling. Depending on the weather, the flight into the Zhupanova can be as short as 30 minutes or as long as 50 minutes; either way you’ll pass dramatic mountains and towering volcanoes – enjoy the ride! 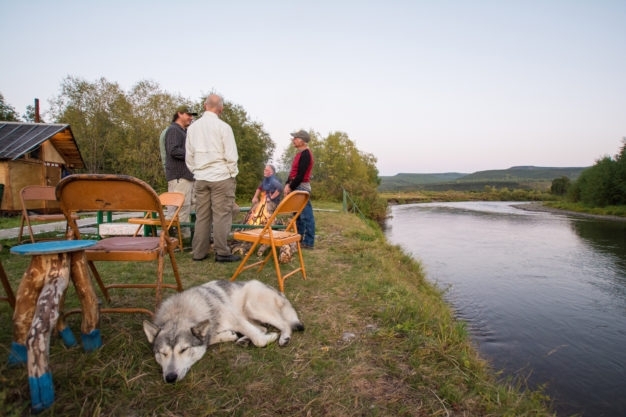 The helicopter will most likely land first at Zendzur Lodge and drop off those anglers, then continue on upriver to Camp One on the Zhupanova Float. Upon landing, guests will meet the guide staff, who will assist in gathering your luggage from the helicopter and showing you to your cabins. The head guide will give everyone a quick orientation and fishing talk, and the guides will help you set up and organize tackle. 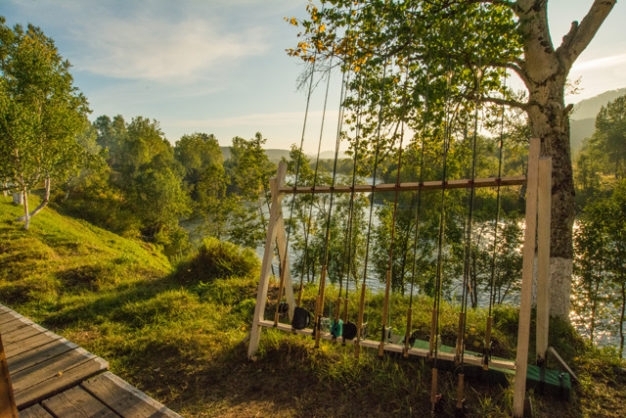 For those wanting to fish, there is some great water right in front of the camp, and many guests are able to hook their first fish of the trip before dinner. 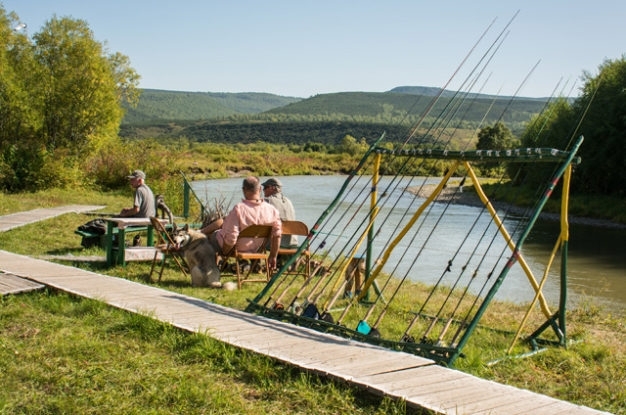 Monday through Friday – 5 full fishing days: After a leisurely breakfast each day at 8:00 am, you will be assigned a guide and begin the day’s float. The crew employs a guide rotation system so anglers and guides have a chance to fish with and get to know one another over the course of the week. Angling boats are organized over the day’s section of river either on a beat system, or by ‘leap-frogging’ each other, with the effect that everyone casts to un-fished water all week long. 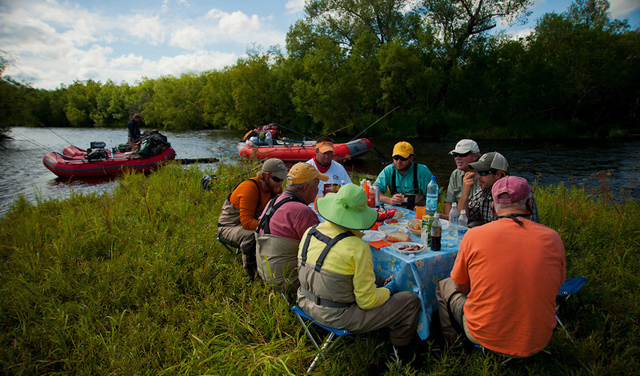 During the morning, the cook floats past anglers in his raft and prepares lunch at a predetermined gravel bar where all three rafts meet for lunch before continuing on downriver. In total there are 48 river miles covered over the course of the trip. Between 5:00 and 7:00 p.m., boats arrive to the night’s camp and dinner is served at around 8:00 p.m. Showers are always hot, cabins are cozy, food is good and plenty of electricity lights the camp during the few hours of darkness each evening. Sunday - Returning home: On the final morning, guests have time to dry clothes and waders, re-pack their bags, and prepare for the trip home. 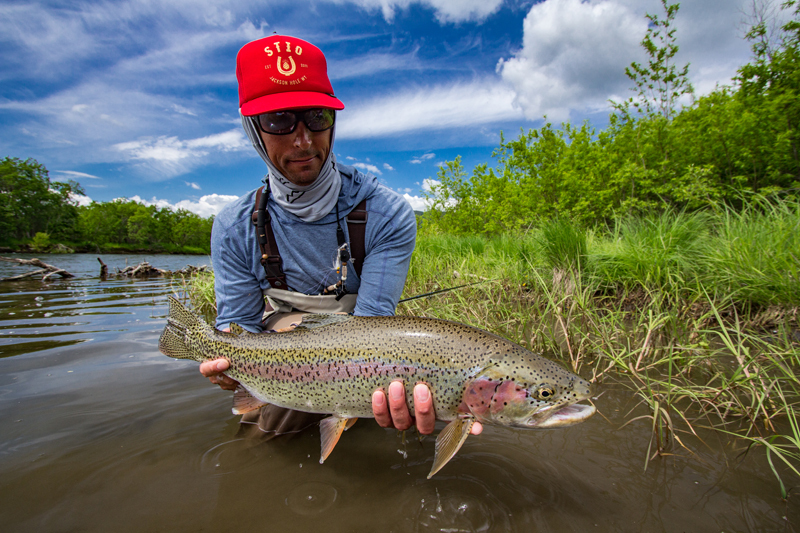 If you want to fish this last day there is ample time in the morning for several more hours of fishing around camp. 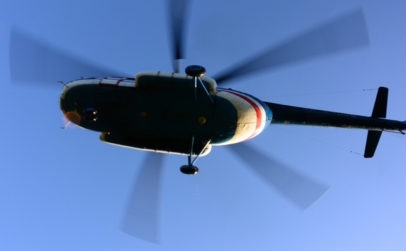 The helicopter will arrive sometime between 12:00 pm and 4:00 pm (depending on weather clearance), and will transfer you back to Petropavlovsk in time to catch the 8 p.m. flight back to Anchorage. Andrey will meet you again and transfer you to the airport. If there is time, the bus can also take the group to a nearby store for souvenir shopping. Andrey will get everyone the departure paperwork at this time, which you will need to present along with your passport and visa at immigration before boarding the flight home. The flight lasts about 4.5 hours. 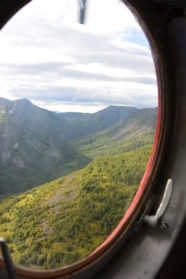 Although you depart Russia on Saturday evening, you also cross the dateline again, thereby arriving in Alaska at 5:55 a.m… on Saturday morning! 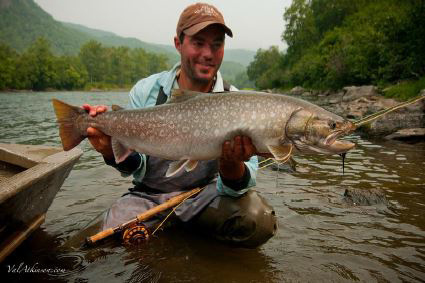 Customs and immigrations in Anchorage is very quick and easy, and you’ll have the whole day to connect back home, or to other fishing in Alaska. If you are traveling home via Moscow or Seoul, you will have to arrange an overnight in Yelisovo (we can help coordinate this) to catch the morning departure the following day. Always remember, our services are provided absolutely free to our guests. Booking a trip through Hemispheres Unlimited WILL NEVER COST YOU A SINGLE PENNY MORE than booking it directly with the lodge or outfitter, but does reap the benefits of our extensive experience with that destination, as well as our ongoing support services available to you at any time prior to, during, or even after your trip. The rates indicated are based on the 2015 rates, and are subject to change for 2016. Final dates and rates for 2016 are finalized in the fall. 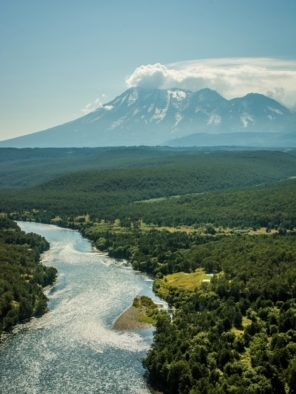 Contact a Hemispheres Unlimited travel planner today, and get started on putting together your Zhupanova River Float Trip Adventure of a lifetime in beautiful Kamchatka!